Due to the funding lapse at certain federal agencies between 12/22/18 and 1/25/19, FERC is reopening the comment period on the Adelphia Gateway Project environmental assessment until 3/1/19. Click here to read. 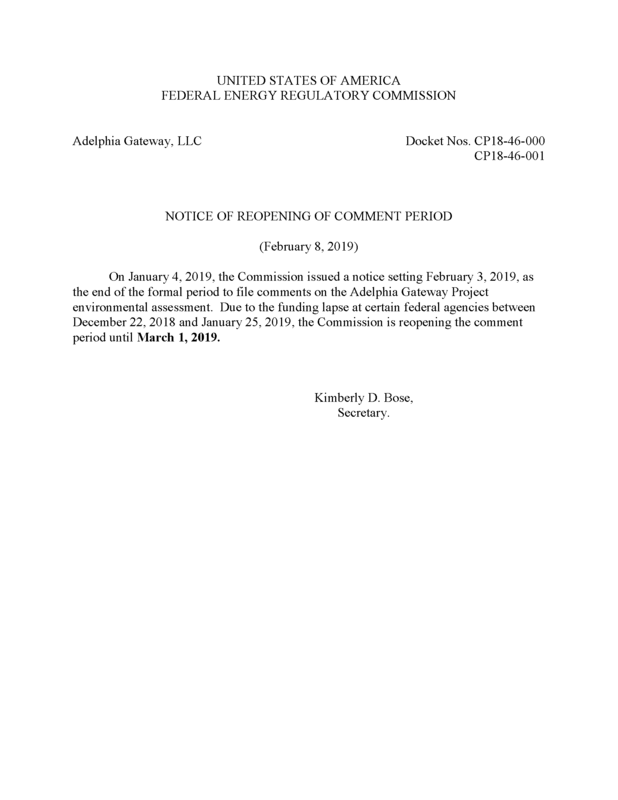 East Goshen Township’s Comments regarding the Adelphia EA were filed with FERC on 2/1/2019. Click here to read. At their meeting on 1/29/2019 the Board of Supervisors approved filing comments in response to FERC’s request for comments on the Adelphia Environmental Assessment. The Federal Energy Regulatory Commission (FERC) has released the Environmental Assessment for the Adelphia Gateway Project. Rick Smith, West Chester, PA. In light of the concerns expressed by several of our Township residents I am writing to request that Adelphia be required to prepare an Environmental Impact Statement. Rick Smith, East Goshen Township Manager. What is Adelphia Gateway Pipeline Project? What is the regulatory process to approve this pipeline? What is the current status of the approval process? What are the concerns with respect to impacts from this pipeline? What opportunities are there for residents, municipalities, and elected officials to advocate for public safety, private property, clean air and clean water? 30 minute PowerPoint presentation to be followed by Q&A and community discussion. All residents and township officials from across the region are welcomed and encouraged to attend this event. Light refreshments to be served. More information here. Click here to read the Public Notice from Federal Energy Regulatory Commission on the Adelphia Gateway Pipeline Project. East Goshen Township has filed a Motion to Intervene Out of Time in response to Adelphia Gateway’s application to acquire, own and operate the existing pipeline facilities in Pennsylvania. This filing has been accepted. On Monday, January 29, 2018 survey crews on behalf of the Adelphia Gateway project will be conducting topographic surveys to the Interstate Energy Pipeline Easement. The purpose of the work is to gather all above-ground features. The only equipment crews should be using on Monday is GPS equipment. All survey activities will be limited to within the existing easement or on public roadways. Click the link to view the notice Adelphia posted in the Philadelphia Inquirer on January 26, 2018. On January 12, 2018 Adelphia submitted an application to the Federal Energy Regulatory Commission (FERC) for Certificates of Public Convenience and Necessity. 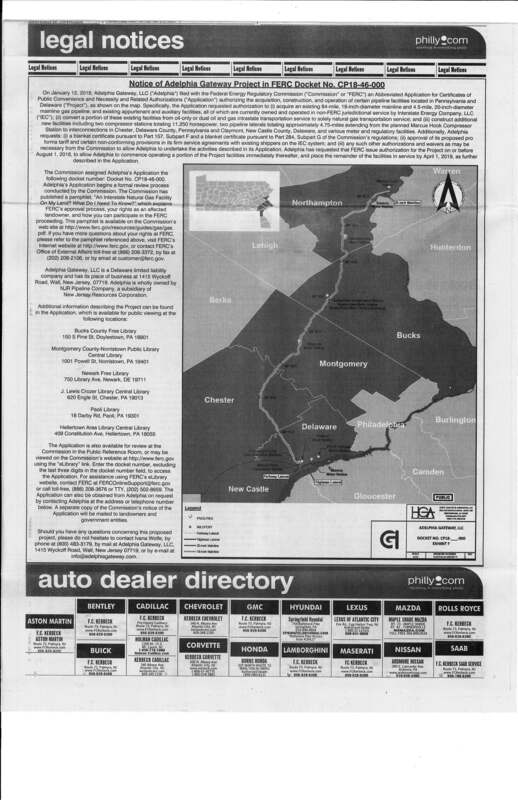 It has been brought to our attention that Adelphia Gateway LLC plans to convert the Interstate Energy Pipeline, which currently runs through East Goshen Township, to carry shale gas. More information about the project can be found through the following link to Philly.com. The Interstate Energy Company Pipeline runs through the Township’s open space in the Wentworth development which is located by the CVS Drugstore. At their meeting on December 5th the Board of Supervisors acknowledged receipt of a letter from Adelphia Gateway regarding possible changes to their right-of-way. The Township also has recently been advised that other property owners have received similar letters. What does all of this mean? Based on what we know, Interstate Energy is a Public Utility that that has a tariff from the Pennsylvania Public Utility Commission to transport natural gas and oil in the eastern part of the state. The following link will take you to the Chairman’s letter that appears in our Winter 2018 Newsletter. The Township will continue to monitor this matter and provide updates as required. The Board of Supervisors encourages residents to contact the Governor and State Legislature to change the state laws that govern pipelines.